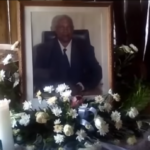 Video: The Aandonga traditional community and Namibians in general are mourning King Immanuel Kauluma Elifas who passed away yesterday. Oshikoto regional governor Henock Kankoshi was one of the first government leaders who rushed to the Onamungundo Palace to be with the bereaved royal family. THE death of King Immanuel Kauluma Elifas has brought about the much needed reconciliation between two squabbling factions of the Ondonga Traditional Authority. Members of the two factions, who run parallel tribal offices – one at Oluno in Ondangwa and the other at Onethindi in the Oniipa town – have now united and are working together to give the much loved King Elifas a dignified farewell. Only time will tell whether the reconciliation produces a permanent effect or it is only temporary. According to senior traditional councillor Vilho Kamanya, an ad hoc committee was set up to manage the affairs leading up to the funeral of the late king. Kamanya, who is of the Onethindi tribal office, chairs the committee. He said that the passing of the King requires that petty differences are put aside and the King’s subjects mourn together to ensure a dignified burial for their leader. The main committee has formed specialist sub-committees dealing with specific matters such as security, media, finance, protocol, catering, transport and logistics.